After visiting grand Shanghai and glittering Chongqing, it was in a taxi in Dongguan that my view of China took a small, but important shift. I was traveling with a friend to the South China Mall, down the main road that stretches from the city’s train station all the way out to the suburbs. It was Olympics time, but we were a far cry from Beijing’s impressive Bird’s Nest. The train station was bustling with passengers, laborers and managers who clogged up nearby cafes and bars, eating cost-efficient meals before getting on buses to their offices or factories or wholesale shops. We were trying to get to a magical place, though, a place hailed as the world’s largest shopping mall. But we knew something was not quite right as the crowds thinned out and the buildings got taller but the streets got emptier. The downtown megacity was full of half-empty towers and ambitious but abandoned construction projects for new skyscrapers. The media, even China’s state-media Xinhua, was already reporting on falling property prices and demand well before the Olympics, and in Dongguan, it was obvious, even to our taxi driver, that things were not as great as so many people thought they were. At a University of Southern California conference on Friday, scholars gave more academic perspectives on China’s Olympics. Anthropologist Susan Brownell discussed China’s goals as hosts. Contrary to popular belief, she said, most of their efforts were turned toward their domestic audience. They did not have a “master plan to promote a positive image of China to the outside world.” She outlines this argument in a post on The China Beat and in her book, Beijing’s Games: What the Olympics Mean to China. China promised to host a “People’s Olympics,” but can that kind of agenda survive, or even have any effect on the post-Olympics ground reality? Stanley Rosen raised the question, citing the warnings of state-run weekly magazine Outlook. Because of rising unemployment, reporter Huang Huo wrote that China is entering a “peak period for mass incidents.” Rosen, a USC professor of political science, pointed out significant, and emotional, upcoming anniversaries; May 4 will mark the 90 year anniversary of Beijing student protests that sparked the May Fourth Movement for populism and June 4 will mark the 20 year anniversary of the violent put-down of the Tiananmen Square protests. Economist Jeffrey Owen stressed that the Olympics did not provide direct financial benefit to Beijing or China. With a $40 billion price tag, including Olympics and Olympics-related costs, the gains come more in the form of less quantifiable “legacy effects,” the good feelings, China brand building, and the international education received by volunteers, students and residents of Beijing. Certainly, Chinese residents of the second-tier cities, like Chongqing and Shenzen, felt pride for the country’s successes, even though they were far-removed from the glamor and cameras. But still, they, like me and my traveling companion, became very tired of the Game’s soundtrack. So what happened when we finally got to the world’s biggest mall? 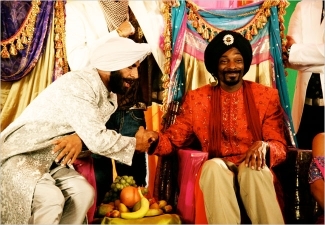 My friend, Anka Lee, wrote about it for NBC in San Francisco. But I think you can guess that it was not as triumphant as Beijng’s fantastic opening ceremonies. The Country Estates, a gated community about 1 mile up the road from our house has been evacuated. There is an evacuation center set up at my alma mater, Diamond Bar High School on Pathfinder Road. We feel pretty safe here on the southwest side now, though we are ready to pack up and go if necessary. A lot of neighbors have already packed their cars just in case. The air quality is abysmal though. When you step outside it feels a bit like a huge barbeque gone wrong and it’s not clear if the heat you’re feeling is just from the California sun, or if it’s coming from Tonner Canyon over the hill. The side streets have a flurry of activity, but the freeways are eerie and empty. Businesses are open still and life is going on, just with some apprehension. Fire fighting planes and helicopters have been flying low over our neighborhood since earlier this morning, making a massive effort to protect the city. 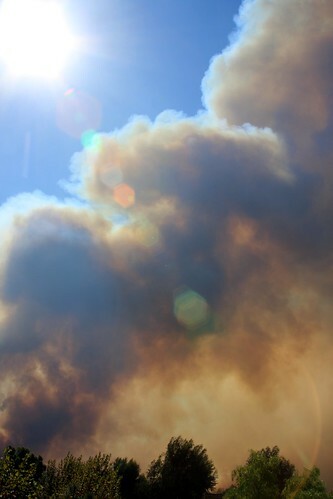 I read later on L.A. Now that 15 helicopters and 10 air tankers are in the fight. If you watch the local news, they are trying to see Diamond Bar from helicopters, but the smoke is so thick you really can’t see anything, particularly arund The Country. I have not seen or heard of any actual flare ups in the city, however. Here’s what it looks like behind my house. It’s a lot like the Oregon Trail, driving out to Riverside. The road gets emptier as you go further along 60 East. There are warning signs: GUSTY WINDS AHEAD. You hope your passenger doesn’t die of cholera. At one point, the trail divides. You can choose the 15 to Barstow, and if you keep going you’d get to Las Vegas. But we stayed the course. All for the sake of a documentary about David Choe, a Southern California graffiti-artist-turned-hispter-phenomenon. If you’re from Los Angeles you might recognize his work even if you don’t know who he is. On the street, he’s famous for spray painting huge whales saying funny things on freeway retaining walls. His gallery showings include paintings made with soy sauce and urine from his three-month stint in a Japanese prison, an ice cream shop gallery of his portraits, and a $2.5 million sell-out show in London. The film, Dirty Hands: The Art and Crimes of David Choe, is a cut of 7 years of footage of Choe doing crazy things (traveling around the Congo with a child’s drumset on his back), breaking the law (grand theft for stealing groceries from a frat house), and talking about his life (a bevy psychological problems and addictions, the desire to make his girlfriend happy and God). But the fundamental question I walked away with (from the film and the arduous journey into the armpit of Southern California): does great art or leadership or work require a streak of crazy? Is it necessary to travel down that road, where personal relationships and mental health sometimes suffer, to have singular experiences? Choe himself wrestles with this problem in the film. When he tries to take prescribed drugs for his obsessive compulsive disorder and clinical depression (among other diagnoses), his art suffers. His inhibition — that manic feeling that makes his imaginative and often disturbing art so interesting to look at — was reigned in. He stopped taking the medication. For those of us who keep or inhibitions in tact, like a security blanket that keeps us safe, Choe’s art and life can give us a taste of what goes on in a mind that does anything it wants. And it can inspire us to do the same, to some degree at least. Every major newspaper needs a clever multimedia way to cover speeches at the Republican and Democratic National Conventions. 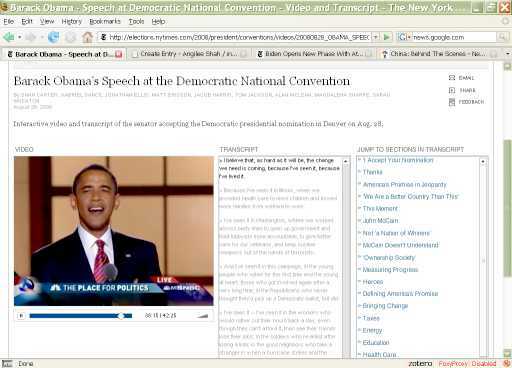 Nytimes.com scores with its streaming video, transcript and hyperlinked outline all in one. But I noticed today that newspaper websites are using word counts to add graphical interest. 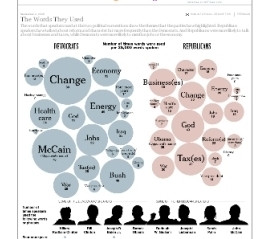 But what can you tell from the fact that Republicans used the word “God” 43 times and Democrats used the word “McCain” 78 times during their conventions? I’m not completely sure — but it’s nice to look at. Again, nytimes.com wins for design — they go the extra step to provide numerical breakdowns, and breakdowns by speaker. 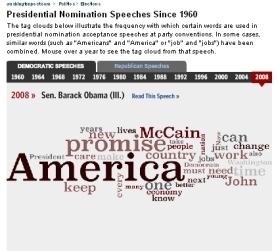 Washingtonpost.com wins for interesting content — they compare buzz words across history. It’s fascinating to see what has changed over the years, and even more so to see what hasn’t. 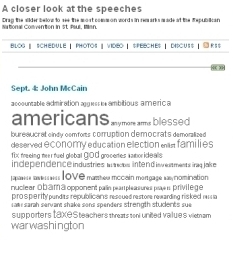 My hometown paper, latimes.com, unfortunately suffers from not putting word clouds side by side, leaving in links to nowhere, and generally not providing much more than an automatically generated tag cloud, with generic text below it. Here are the screenshots, linked to their sources. Read the article word cloud analysis?